Contact the pros! Artistic Associates is the first option for upholstery restoration in Davis, California. Our upholstery cleaning service receives respect from businesses like Allied Custom Upholsterers, Rytina Fine Cleaners and the most demanded interior designers. We care for Sacramento’s most complex furniture damage because of our expertise, our equipment, our honesty and our more than forty-year track record of excellent customer service. Expertise – The technicians employed by Artist Associates are all The Clean Trust (formerly known as IICRC) certified. That means we comprehend the art of linking fabric materials, weaves, style, hue and finish with the correct methods for restoring their original beauty. Without this skill, many restoration companies actually do more damage than benefit when attempting to clean your upholstered items. Equipment – Artistic Associates has a specialized facility to clean all of our more complex Davis upholstery restoration commissions. Our restoration facility uses equipment available nowhere else in the Sacramento area. Here we clean problems in chenille, wool, silk, jacquard and white or off-white fabrics. Our investment in the right equipment is your assurance of a job well done! Honesty – Artistic Associates thoroughly examines every upholstery cleaning referral before we agree to accept it. If the water damage, soiling from pet urine, staining or tearing is too great to clean, we tell you right away. If years of experience and study logically indicate that Artistic Associates cannot restore the upholstered item to its original condition, we will not take your money while just “trying” to clean it. Customer Service – We earned our respect and our credentials by satisfying our customers, big and small, job after job. Artistic Associates is family-owned and operated, with more than forty years of satisfied customer reviews in Davis and the Sacramento metropolitan area. Our service is provided by experts you can trust. Insured and Bonded – Artistic Associates guarantees that each referral will be done the right way and to our customer’s satisfaction. 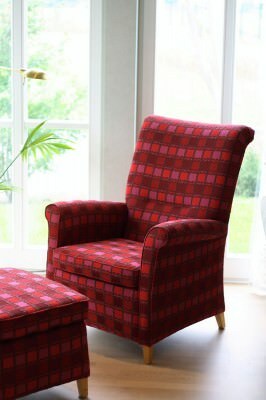 We are also fully insured to care for your upholstery. Artistic Associates – the full-service upholstery cleaners for Davis and the Greater Sacramento area. Contact our friendly staff to clean furniture problems from spills, pets, and water damage and the odors from smoke, animals or other causes. Plus, we can improve the life and condition of your furniture with the best in safe fabric protectants that save your furniture from harmful problems in the first place. We encourage our future upholstery cleaning friends from Davis to ask for an estimate with us at 916.483.7400. Artistic Associates is prepared to assist with any and all of your upholstery cleaning, restoration and preservation requirements!